Kenmare News | Thanks John! John O’Shea from Letter, Moll’s Gap, recently ran a fundraiser in New York to help fund the new Centre of Excellence currently being built by Kerry GAA at Currans, near Kerry Airport. 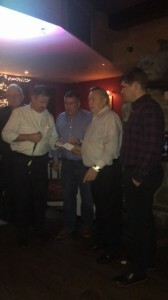 John is pictured presenting a cheque for $53,000 to Patrick O’Sullivan, Chairman Kerry County Board during the Kerry teams recent trip to the Big Apple. Also pictured are Jim Mackessy from Tarbert, treasurer of the event, Eamon Fitzmaurice, Kerry Senior Manager and Gerry O’Shea, originally from the Lauragh area who was also a member of the committee. John was especially proud to have three local boys there on the night with the team; Templenoe’s Tadhg Morley and Gavin Crowley, as well as Kenmare’s Stephen O’Brien. John and his committee are anxiously awaiting the completion of the new 48 acre training facility at Currans and are hopeful that their contribution will help towards getting it up and running sometime in 2017.